To be released shortly (late May) on the VV label will be their fifth release entitled "A Man At The Top!" featuring the complete live soundboard recording on August 10th 1970 Las Vegas opening show . The double vinyl will be accompanied from a DVD with the best video possible of the show . After the success of the first four releases We decided: to give you more.….. so we decided to not only bring you the best audio , but also the best video quality possible. The producers are aware of the fact that the opening night show, as one of the best Elvis Presley concerts ever, has been previously released in different imports. But Here we give you the chance to listen to the show in its entirety FOR THE FIRST TIME in a double high valued collector heavy vinyl set. At the same moment FOR THE FIRST TIME as bonus will be included a DVD OF THE SHOW giving to this release the status of “UNIQUE”. “A Man At The Top” wants to give you a unique perspective of the man and his music during this August 1970. This will be the first STEP of a wider project, infact the producers’ intention is to accompanied this first volume with other three volumes, in the way to cover all the soundboarding recordings of August 1970. About the Vegas opening night has been already said a lot a words, so We like spend some words on the DVD here presented…. A lot s of DVD floating in the previous years including footage from the different quality and the missing audio….some time ago the producers acquired a three dvd set with included all the footage shot from the opening night, directly from the same source in a very good quality. All the different camera angles have been edited to create a real professional movie. All the footage has been digitally restored in matter to achieve the best result of image quality. All the footage includes matching audio from the original concert in the way to get a perfect syinc between audio and image with speed correction of the original footage. Although the show is no complete , the result believe us is very impressive, Elvis as you never seen..THE BEST QUALITY TO DATE!!!!! The DOUBLE LP SET 180 VINYL GRAM, IT NEVER SOUNDED BETTER!!! !is a LIMITED HAND NUMBERED 500 COPIES. It comes with an three fold 300 gram high quality GLOSSY sleeve both sides printed, giving an unique view. 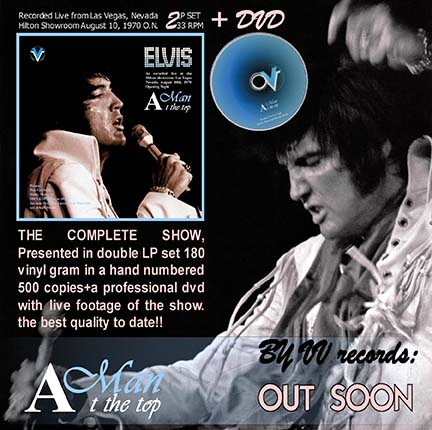 The sleeve will be accompanied Newspapers clips and with many photographs of the opening night., giving to the reader an unique document to read, listen and see, with Elvis at his best ..A MAN AT THE TOP of his possibilities..
VV LAVEL added a DVD cover, as a bonus, so each customer can decide by themselves if they will want to keep the DVD inside the book or inside a proper single DVD case. We hope you can enjoy this FIFTH product in the way to give life to the next volume soon as possible. You can place your order at your favorite dealer from now on. Approx running time 36.00 min. Does the After Show Party include bed room scenes?..